Choosing where to go for lunch can be a challenge given the amount of options (or lack thereof) in North Austin. Something fast? A place where you can sit outside? Maybe something you’ve never tried. Some of the best lunch spots in town can be found north of 2222. If you’re looking for a place to visit for lunch today or sometime soon, give these 5 North Austin lunch spots a shot. Why You Should Go: The first thing you’ll notice at Garden Spot Cafe and Catering is the friendliness of the staff. This order-at-the-counter gem has been around since 1982 and specializes in sandwiches, salads and homemade sides like potato and pasta salad. You’ll find plenty of room inside and limited outdoor seating. 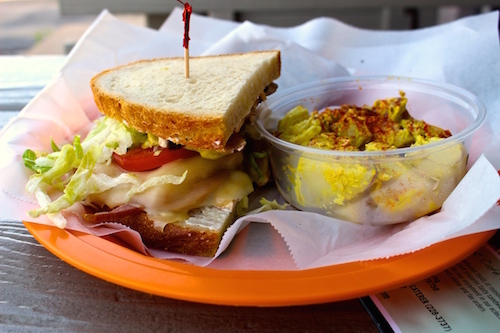 But regardless of where you sit, Garden Spot Cafe is a solid bet for lunch in North Austin. They also cater lunches and special events at reasonable prices. What to Order: Their combo meals are the way to go. Order half a Red Baron (smoked ham, melted provolone, cream cheese and mushrooms on sourdough) with a side of potato salad. Another favorite is the Texas Trucker with smoked turkey breast, bacon and BBQ sauce. If you go on a Tuesday, you may find one of their catering menus available. But don’t take my word for it; experience this place for yourself. 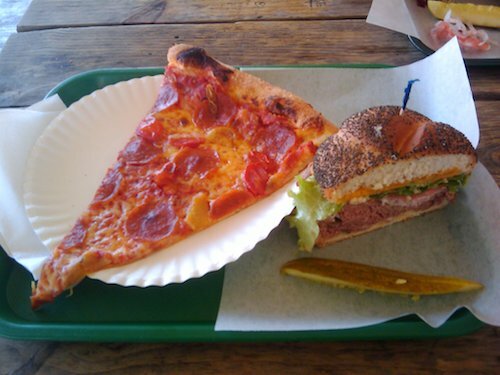 Why You Should Go: If you claim to be an Austin pizza connoisseur and haven’t been to Little Deli, then you should reconsider your life choices up to this point. I’m being dramatic, but their pizza is absolutely top notch. Not too heavy on the sauce, not too heavy on the cheese, and the crust holds up well. Indoor seating is limited, but they have plenty of picnic tables to sit down outside. What to Order: You can order by the slice or get an entire pie if you’re with a group.Pepperoni is always a solid bet, and they also have cheese pizza by the slice as well as a slice of the day. If you’re looking for a deep cut, order one of their calzones or the roast beef sandwich. Don’t forget to post your meal on Instagram to make your friends and co-workers jealous. Why You Should Go: Their duck is simply delicious. Crispy skin, fatty and full of flavor, their duck is a welcome reprieve from the usual lunch suspects of sandwiches, soups and salads. Inside you’ll find a dining room that is modest, warm, and very comfortable. What to Order: There’s no “official” lunch menu, but you can’t go wrong with the duck or pork and a side of steamed buns. 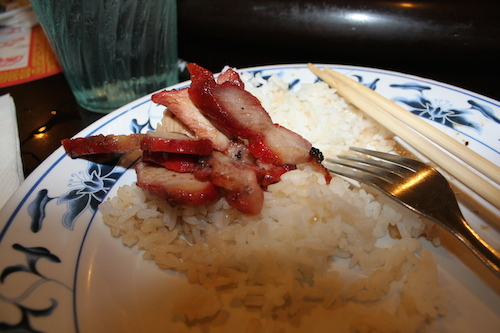 They offer an extensive regular menu with items commonly found at Chinese restaurants such as Kung Pao Chicken, Lo Mein and vegetarian options. Our Editor’s personal favorite is the Sesame Chicken. She’s been ordering the same thing for years. 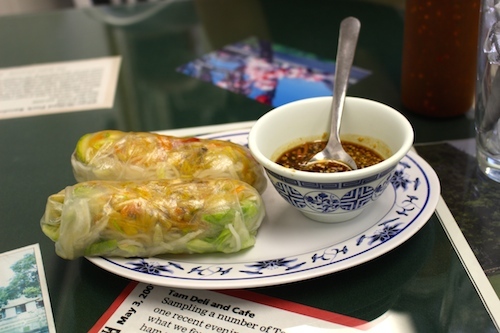 Why You Should Go: Tam Deli is a Vietnamese restaurant on North Lamar with a large menu and reasonable prices. 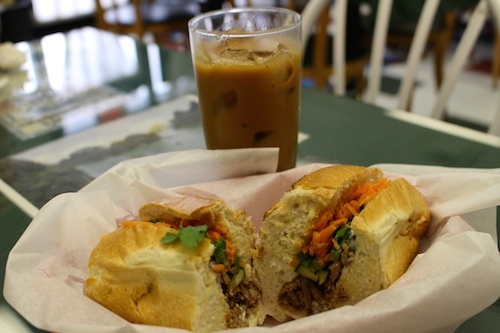 If you’re craving Pho, Vermicelli or a solid Bahn Mi, Tam Deli will not disappoint. The tables are decorated with clippings of newspaper articles praising their food. The dining room is comfortable and can accommodate solo dining, a family or your office’s fantasy football league. What to Order: The pork Bahn Mi (No. 14) is incredible. The bread is crusty on the outside and keeps the pickled carrots, cucumber and jalapeños in their place. The pork is slightly smoky and the homemade mayo ties it all together. Order some veggie spring rolls and hold on to that peanut sauce. You’ll know what to do with it when the time is right. Why You Should Go: Tucked away in Northwest Hills, Austin Terrier has been serving up great food for over three years. The restaurant itself has both indoor and outdoor seating. It’s a place that’s friendly to all, including dogs–as the name implies. 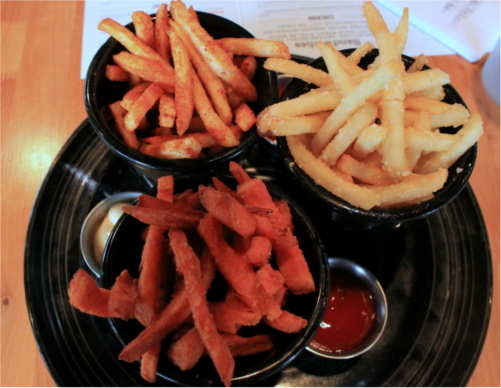 What to Order: The Trio of Fries is a popular choice, featuring sweet potato, truffle and parmesan, and paprika and mustard fries. They do have lunch specials, like a 1/2 sandwich and 1/2 salad, or 1/2 sandwich and soup. If you’re not feeling like a sandwich or salad, chow down on one of their delicious pizzas. BONUS: Taco More (pronounce “Mo-Ray”) at 9414 Parkfield Dr off Rundberg for your weekly dose of delicious tacos. You won’t regret it. The next time someone asks you for a lunch recommendation, give one of these 5 spots a try. North Austin has plenty of options and I’m just scratching the surface with these ideas. Happy lunching, friends. What is your favorite North Austin lunch spot?